There might have only been just over 10 weeks in the term but we certainly managed to do a lot! 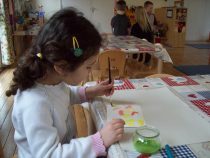 Our project work was based on Health and we had some interesting discussions about exercise, diet and a healthy lifestyle. The children really got into healthy foods and learnt to identify which food belongs to which food group and why and how much of it we need to eat it. We also looked at sugar and we were all quite shocked by the amount of sugar in so called healthy drinks and snacks that many children regularly have in their lunch boxes. One drink or snack seems to contain more than the recommended intake of sugar for an entire day! We made a decision to cut down on some of the sugar we consume by only drinking water at lunch time in Nursery. The children enjoyed trying some different fruit and vegetables at snack time and they especially enjoyed occasionally having a bowl of cereal instead of a biscuit. 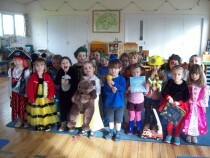 We celebrated World Book Day on 3rd March by inviting parents to come and read stories to the children who had dressed up as a character from one of their favourite books. 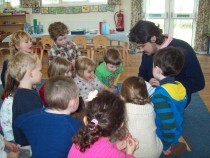 There were pirates, princesses, bees, ladybirds and many other wonderful creations. 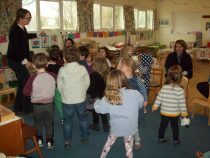 For Sport Relief the children decided to wear their pyjamas to Nursery and we provided breakfast for everyone before the games began. Lorna organised an obstacle course and three activities that the children rotated round involving ball skills and team work. 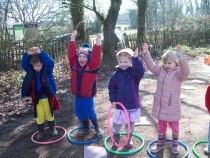 The children also enjoyed a treasure hunt and parachute games. We raised over £100 and had a huge amount of fun doing it. 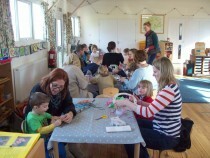 We were, as usual, invited to take part in the Froxfield and Privett Ho rticultural Spring Show and this year parents and grandparents came into nursery to help make Wind Catchers. The result was quite extraordinary – so many different materials and designs and each one unique. 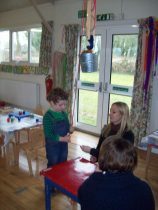 Just before the end of term we held an Open Morning for current and prospective parents to come and see the huge range of activities, materials and resources our children regularly have access to. 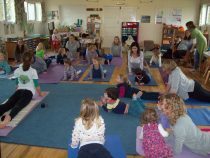 As a one off, we also invited parents to join the children doing Yoga with Roessa. At the end of January we had said goodbye to Rachel who left us to manage her own dog and cat caring business. However, we are delighted to welcome Fay who joined us at the beginning of the term and took over where Rachel left off!